Gymnasts from Germany, Great Britain, Latvia, Lithuania, Norway, Ukraine, USA, Moscow, Sent-Petersburg, Vladimir, Novgorod and other Russian gymclubs will participate. will be from 10 to 16 y.o. The program is original and spectacular. so they did not take part in the sinior competition. Olympics champion Evgeniy Podgornuy and Olympic silver medalists Elena Dolgopolova and Elena Grosheva compete ! ! ! as the head referees and participators of veteran's competition together again ! Sponsorship by Novgorod State University, Federal, regional and city Administration, "Coca-Cola", "Kodak- Express", "Gymnova" (British branch) and Russian companies. 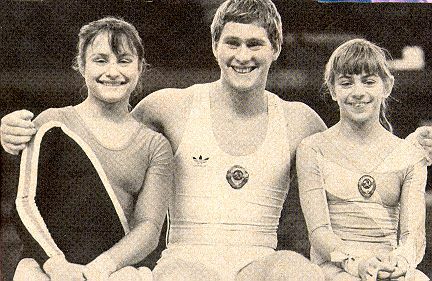 Information about Tournament: "Soviet Sport", "The Gymnast" (UK), "Gym Stars", "International Gymnast" and Internet.